We were chatting about the days when our children were young—back when we both realized that homeschooling was the ideal choice for them. But even in homeschooling circles, we came under a lot of pressure because of their behavior. Some people saw our children as problems. Every piece of advice or bit of “encouragement” they gave us could be summed up in one sentence: Please fix your kids. 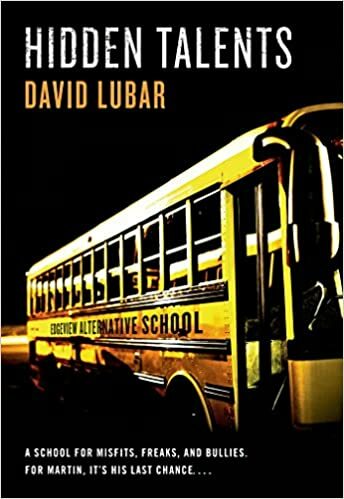 Hidden Talents by David Lubar is the story of Martin, a teenage boy enrolling in a last-chance reform school. Martin is mouthy and knows how to push people’s buttons, which is why he’s been expelled over and over from regular schools. He soon makes friends with a motley assortment of guys who insist they’re falsely accused of whatever landed them there. One says he’s not an arsonist, even though he’s always starting random fires. Another says he’s not a plagiarizer and cheater, even though the reader gets glimpses of his schoolwork that exactly mirrors what his seatmate writes. Another is not a thief, although his room is stuffed with objects that don’t belong to him. What they don’t realize is that their problems stem not from criminal tendencies, but because each possesses a supernatural gift that he’s never learned how to control. Martin is the one who solves the puzzle about his new friends. Well, part of the puzzle. After all, Martin has his own problems, doesn’t he? As I revisited this book, I realized why it struck such a chord with me. My own children’s “problems” weren’t criminal in nature (nobody was lighting random fires), and they weren’t due to supernatural abilities (who needs a levitating toddler?). But in the way that fiction can reflect and enhance a more mundane reality, my children’s quirks did point to unique talents and personalities. Fortunately, my friend and I both figured out what wise parents know: an unconventional child is not defective. We chose not to discipline them into conformity, but instead guide and correct them into maturity. In the process, we bore the brunt of social disasters, personal catastrophes, and disapproval from people who thought they were better homeschoolers and better parents than we were. But we also learned to understand who our children really are. My son can’t sit still and listen to somebody talk to him because his mind is going in several different directions at once. He can listen to a video, play a game, and finish his history assignment all at once. My friend’s son, whose impulse control was overpowered by his need for knowledge, can’t not learn how computers work. He immerses himself in the subject, and he’s the resident expert on all things digital and cyber. Both young men are heading toward adulthood (somewhat unevenly, let’s be honest) with their curiosity and senses of humor fully operational. Looking back on those early years, I have a much better perspective of what we were going through. Some of my kids’ “problems” faded away with time. Some are issues that we still deal with. And many were embryonic talents, ready to break surface. In the nurturing environment of homeschooling, we can give our children the warmth and space they need. You are right too often we are told to fix our kids when it isn’t a problem that needs to be fixed. I have three Kinesthetic learners and they need to move, touch and immerse themselves physically in the learning process. To many this means they have ADD or ADHD but when they are given the correct learning environment that suits their learning style they can excel. YES! Thank you for writing this!! I have been told that by a lot of people. Thank you for the article. As a teacher, I can say I’ve seen this on multiple occasions. But I want to share something else, and I would very much like your understanding. I learn as much from others as I teach. I can’t tell you how many times I discovered something from watching my students, hearing their views, or looking over their work, and I’ve made adjustments to lessons over the years to reflect some of this. One child, whom the parent shared was difficult and couldn’t sit still (This supported by his past teachers>) I had no difficulty after the first two weeks. Why? I watched him. I asked other students what they knew about him, what other teachers tried, and so forth. I talked with the parents. Then, one day, the boy and I had a serious talk. I told him, point blank, that he could no longer distract my class/our class. I explained I understood he had difficulty listening or sitting still, but I would appreciate his best effort. If he had to stand, he could stand by his desk. If he had trouble listening, he could draw at his desk, look at a book, but under no circumstances bother the other children. Over the year, I understood more about his difficulties, and I altered some lessons for him. But I never had any future troubles. With another student, I asked, after a couple of weeks, why he couldn’t sit still or remember to complete his work. He said he didn’t know, that he forgets. Now, I had to be creative as I realized he had learned certain “catch phrases,” that worked with other teachers. I explained to him that he does not have my permission to forget. He never had heard that before. And suddenly, his excuse no longer worked. And again, I still sometimes altered lessons to create some variety, but he never forgot his work again. But, I have had a couple of students who tried but were incapable of focusing at any great length. And for them, we found something that worked. I sometimes explained to the class, that for some students, I might alter procedures for what I believe works best for them. In this way, the class understood, and they worked well, or as well as we hoped.